“The so called data revolution isn’t just about the volume of scientific data; rather, it reflects a fundamental change in the way science is conducted, who does it, who pays for it and who benefits from it. And most importantly, the rising capacity to share all this data – electronically, efficiently, across borders and disciplines – magnifies the impact” (Research Data Alliance outputs). The Confederation of Open Access Repositories (COAR) is an international association with over 100 members and partners from around the world representing libraries, universities, research institutions, government funders and others. COAR brings together the repository community and major repository networks in order build capacity, align policies and practices, and act as a global voice for repositories. COAR’s vision is the development of “a sustainable, global knowledge commons based on a network of open access digital repositories”. “Open access repositories, whose number has been steadily rising, are an important component of the global e-Research infrastructure. The real value of repositories lies in the potential to interconnect them to create a network of repositories, a network that can provide unified access to research outputs and be (re-) used by machines and researchers” (COAR: A Case for Interoperability). Semantic products and standards as well as technical solutions developed and promoted by COAR, the Research Data Alliance (RDA), Food and Agriculture Organization of the UN (FAO) with the Agricultural Information Management Standards (AIMS) and International System for Agricultural Science and Technology (AGRIS) are one of the glues that binds repositories together. They offer great benefit to the community, because they ensure interoperability between repositories and repository content, and facilitate greater discovery and use of research materials. Users need metadata schemas along with controlled vocabularies that clearly describe, explain and associate research publications and datasets with various other entities (involved in the research process) across repositories. Controlled vocabularies are under development by the COAR Interest Group on Controlled Vocabularies for Repository Assets (the work was presented during the COAR Annual Meeting 2016). The vocabulary uses linked data principles and will be available in numerous languages. Once published, the aim is to promote widespread adoption of the vocabulary across the repository community. GACS (Global Agricultural Concept Scheme) developed by FAO (AGROVOC), CABI (CAB Thesaurus), NAL (NAL Thesaurus) with aim to make a common open data repository of terminological and conceptual information in agriculture. GACS is uses VocBench for the editing and is visualized with SKOSMOS. To follow progress of AGROVOC and GASC, subscribe to the AIMS Community! The COAR Annual Meeting 2016 (and COAR General Assembly) took place at the University of Vienna on April 12 - 13, 2016. FAO/AIMS and Global Open Data for Agriculture & Nutrition (GODAN) were represented by information management officer of FAO Imma Subirats and Executive Director of GODAN André Laperrière. Imma Subirats is also one of the leads of the COAR Controlled Vocabulary Editorial Board. 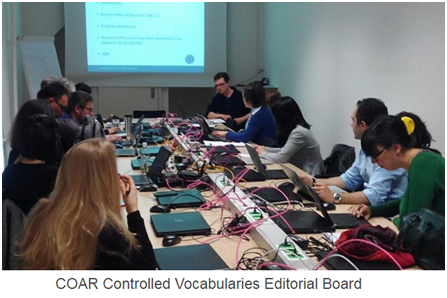 During the COAR Interest Group meeting (11th April 2016) the COAR Controlled Vocabulary Editorial Board presented its first output: COAR Resource Type Vocabulary for Open Access Repositories (v.1.1) as part of the COAR Controlled Vocabularies. The vocabulary has already been successfully tested in EPrints and DSpace (University of Minho/RCAAP) environments. The COAR Resource Type Vocabulary is also currently being implemented in PHAIDRA International and a paper about it will be presented during the 20th International Conference on Electronic Publishing ELPUB, Göttingen, June 7 – 9, 2016. COAR Resource Types as a SKOSified Vocabulary for Open Repositories will be presented during the 11th Annual Conference on Open Repositories. 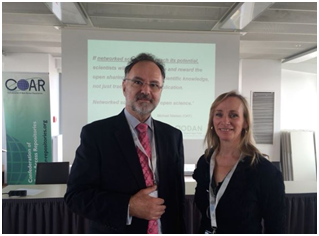 During the COAR Annual Meeting 2016, GODAN and COAR – represented by their respective Executive Directors André Laperrière and Kathleen Shearer - have joined forces in sharing knowledge: open data towards innovation in agriculture (see: How can we improve agriculture, food and nutrition with open data) and promoting the equitable flow of knowledge across the globe to support science and society. Delivering the closing keynote presentation at the COAR meeting, André Laperrière talked about the role of GODAN in promoting global open data for agriculture and nutrition thus contributing to economic growth and interdisciplinary research from a perspective of a complex network. André Laperrière stressed that there are tremendous opportunities for collaboration between COAR and GODAN. GODAN supports the proactive sharing of open datasets (and their packages) to make information about agriculture and nutrition available, accessible and usable in suitable digital repositories relying on syntactic and semantic standards, ensuring the greatest potential for use, innovation and knowledge transfer. COAR has a global network of repositories that can help support the implementation of policies promoted by GODAN. 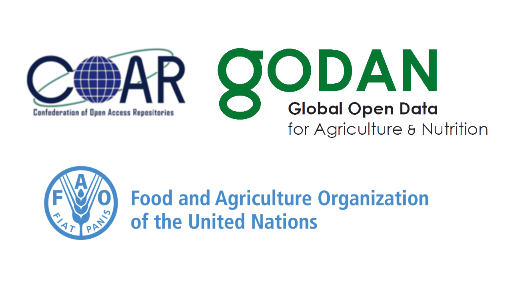 Joining forces, COAR, GODAN and FAO promote the principles and practices of Open Science for greater impact and use of research knowledge globally. FAO is working to enhance coherence in information management standards, tools and methodologies, and to assure interoperability of data and information systems in agriculture worldwide. On the AIMS site you can read about various activities in which COAR and RDA are also involved. Just access the AIMS portal and start the search of the site content entering the respective keywords in the AIMS search form! Webinar. Collective Intelligence Platform for Early Warning and Risk Reduction in Pest Management, by Teerawat Issariyakul (TOT Public Company Limited, Thailand). TBA.